The A1 Diamond Beam Loss Monitor is used to measure beam losses at particle accelerators. It is designed for beam loss diagnostics and machine protection of all types of particle accelerators (e.g. synchrotrons and linear colliders for high-energy physics, electron accelerators for synchrotron light sources, medical accelerators for hadron therapy). The system measures fast AC beam losses from bunched beams simultaneously with continuous DC beam losses. It is sensitive to single MIP particles and has a very high dynamic range. Bunch-by-bunch losses are resolved in real time with the ROSY® Beam Loss Application. ROSY® AX106 is designed to be integrated into any control system. with integrated power supply and GUI, for fast and reliable machine protection. DBLM for 1 MIP - 105 particles per bunch, our standard DBLM configuration. High-Radiation DBLM for 105 - 109 particles per bunch. DBLM for applications in cryogenic environments. Full DBLM System including ROSY® AX106 with integrated Beam Loss Application (DBLM-App). Full DBLM System including ROSY® AX106 with DBLM-App and integrated power supply, as autonomous, portable beam loss monitoring system. DBLM for extended dynamic range, as used at the LHC at CERN, Geneva/Switzerland. 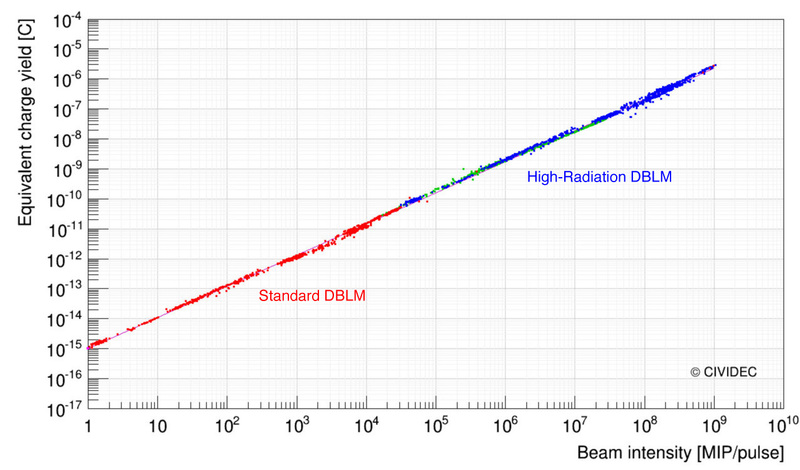 The A1 Diamond Beam Loss Monitor has an excellent linearity over 9 orders of magnitude. The equivalent charge yield of the A1 Diamond Beam Loss Monitor in its standard configuration, as used at the LHC at CERN, is shown in the Figure in red. The A1 Diamond Beam Loss Monitor for high-radiation environments, as used at the HiRadMat facility at CERN, is shown in blue. With the A1 Diamond Beam Loss Monitor the performance of an accelerator can be analyzed on a bunch-by-bunch basis in every detail, thanks to the excellent time resolution of 1 ns and double pulse resolution of 5 ns. The DBLM system at the LHC reveals the characteristic beam structures of the accelerator, such as the 3 μs beam abort gap. The DBLM-App analyzes the beam losses as function of the accelerator turn clock, as shown in the Figure. Diamond Beam Loss Monitors are in use as fast beam loss monitors at the CERN-LHC, Geneva/Switzerland, since 2010. They are used to measure beam losses synchronous to the revolution period of the accelerator. The dedicated electronic chain of the Diamond Beam Loss Monitors includes AC-DC splitters to allow measuring bunch-to-bunch losses as well as the integrated loss on the DC path. For the real-time analysis of the LHC Diamond Beam Loss Monitors ROSY® AX106 is in operation as time loss histogram monitor.